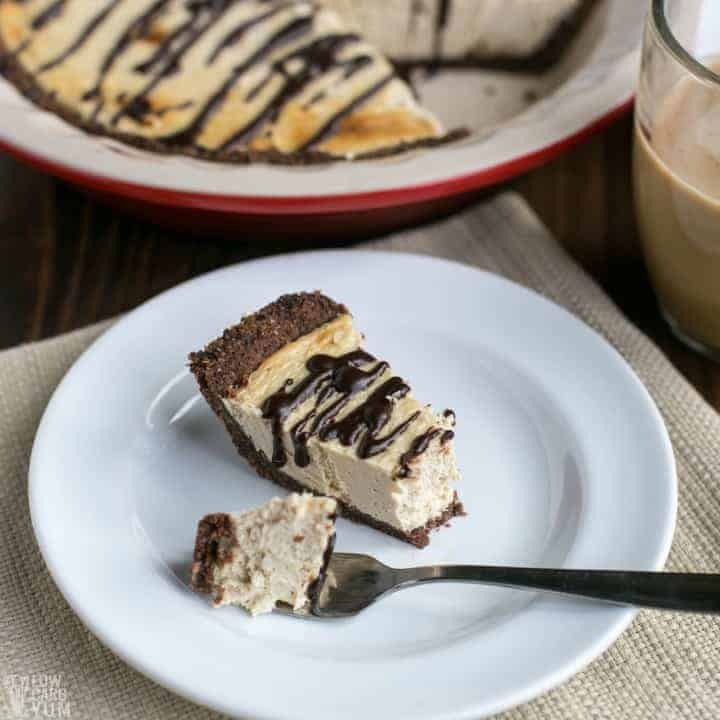 A simple baked chocolate coffee cheesecake pie that’s gluten-free and keto friendly. It’s a classic dessert for any java lover! As a follow-up to to my mocha cheesecake, I wanted to make a filling without the added chocolate. But this time I made a smaller cheesecake pie instead of a full size in a springform pan. 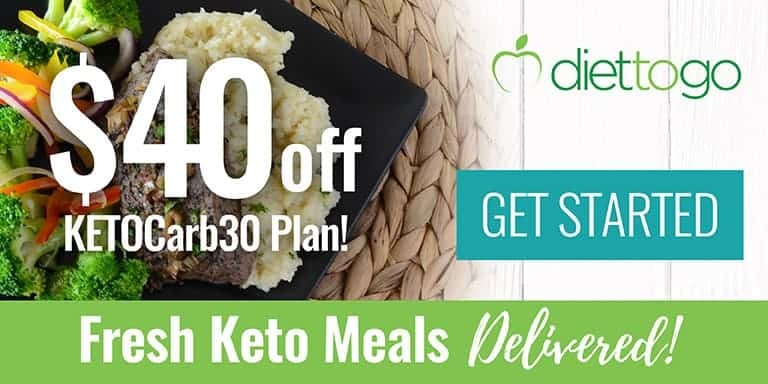 Since I’m the only one who eats low carb desserts in the house, I didn’t want to have too many leftovers. However, cheesecake is a dessert that freezes well so that’s usually not an issue. I have been trying to stay away from sweets, though, so I try not to have too many tempting treats at home. And, when I do make low carb desserts, I try to give them away if I can. 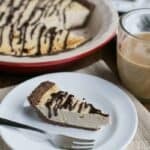 The inspiration for this coffee cheesecake recipe came from a basic recipe I found on a box of Philadelphia cream cheese. 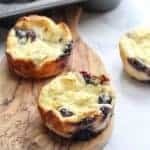 It’s the same recipe that I used to develop my blueberry swirl cheesecake. 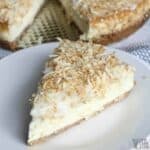 This baked cheesecake pie uses only two 8-ounce bars of cream cheese and a couple other filling ingredients. 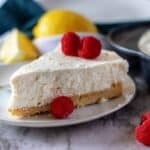 So it’s much simpler than a standard keto cheesecake. The process for making this delicious java flavored cheesecake is super easy. And if you want to make it even easier, just omit the crust. Going crustless also cuts back on the carbs! However, I’m providing a recipe for an almond flour based chocolate crust for those who want one. 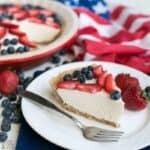 It’s similar to the crust that I use in my popular no bake peanut butter cheesecake. 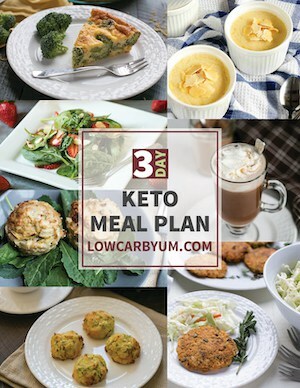 If making a crust, simply mix together almond flour, cocoa, low carb sweetener, and butter then press into the bottom of the pan (photos 1-5). There’s no need to pre-bake the crust and it can be used un-baked as well for no-bake cheesecakes. 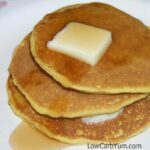 For the filling, simply whip up cream cheese, low carb sweetener, eggs, and coffee flavoring (photos 6-9). I used coffee extract. But a little strong brewed coffee or instant coffee granules can be used instead. However, if using the instant granules, I prefer using instant espresso. Once the filling is made, it’s just spread on top of the crust. 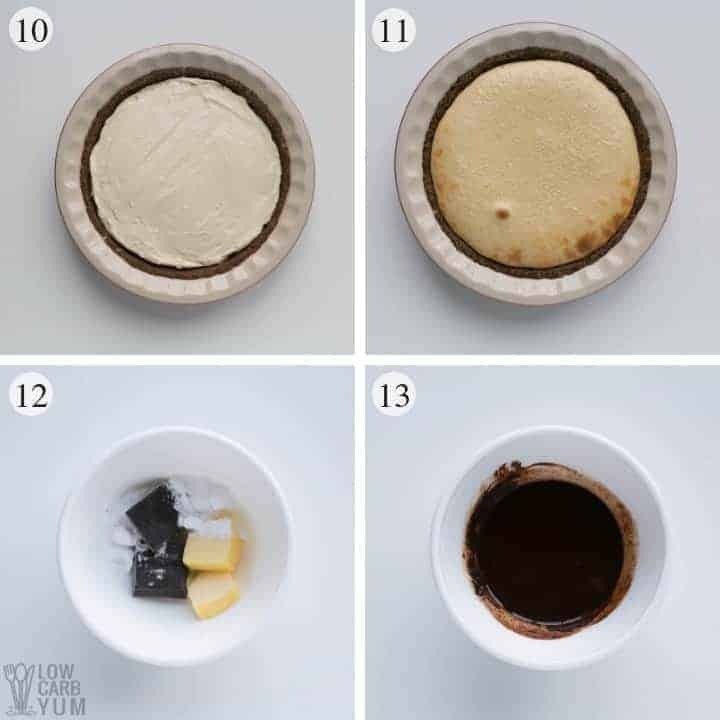 Or it can be spread directly in the pie pan for a crustless coffee cheesecake (photo 10). Then it’s baked at 350°F for 35 to 40 minutes and taken out of the oven when set with the center still a little jiggly. The cheesecake looks a little plain at this point (photo 11). So I like to dress it up with a drizzling of ganache. But adding this extra step is totally optional. To make the ganache, I melt together butter, baking chocolate, and low carb sweetener. Then I stir in a little vanilla extract to enhance the chocolate flavor. While still warm, it’s drizzled on top of the coffee cheesecake. After cooling, the cheesecake should be stored in the refrigerator. 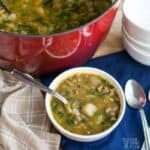 You’ll want to make it ahead and let it chill for at least a couple hours before serving. 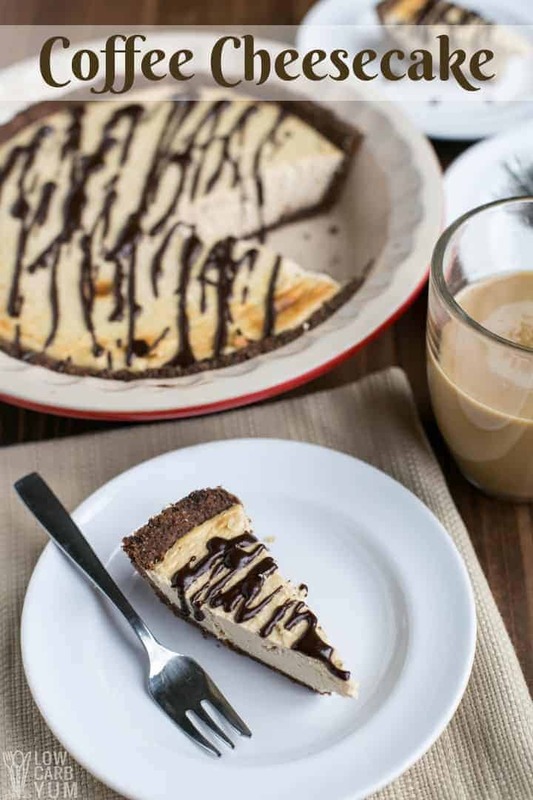 If you’d rather have a no bake coffee cheesecake pie, a coffee flavoring could be added to a basic low carb no bake cheesecake filling. Since the crust can be used unbaked, simply spread it into the crust and chill to set. 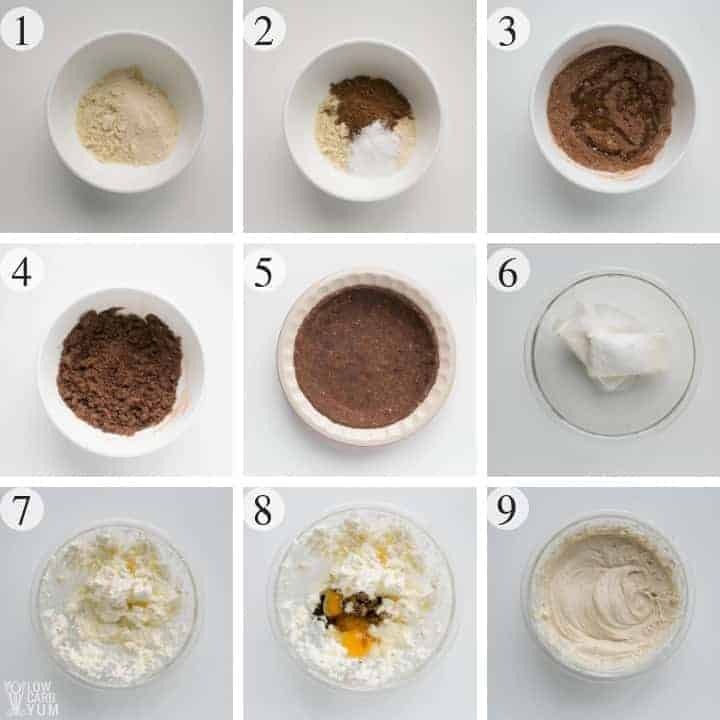 Another option for a no-bake cheesecake would be to double my keto cheesecake mousse recipe and mix in some coffee extract or instant espresso granules. It’s a lighter and fluffier cheesecake filling. You can also use a brownie crust instead like the chocolate brownie cheesecake squares or the cheesecake brownies. And instead of baking in a round pie pan, the cheesecake can be baked in a square pan for bars or squares. 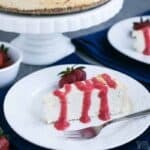 Enjoy this easy baked cheesecake recipe! And don’t forget to let us know how it turned out by leaving a comment below. We’d also love to hear about any modifications you’ve made. 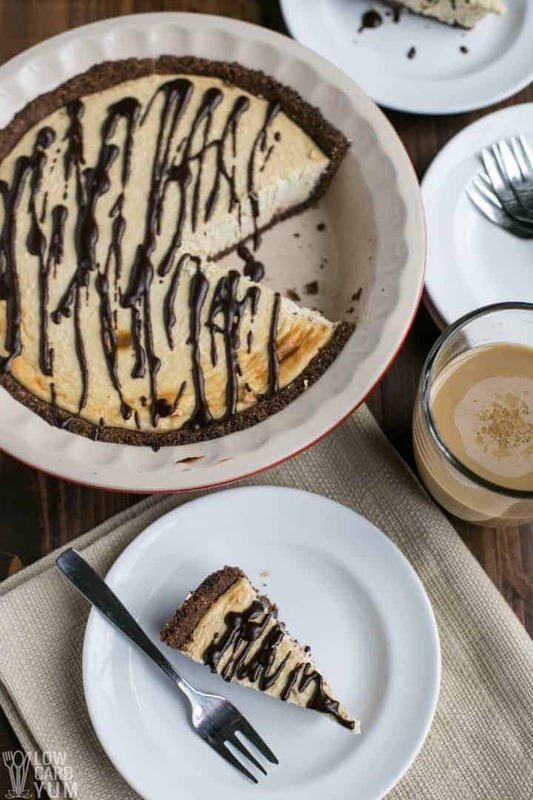 A simple baked cheesecake pie with coffee and chocolate flavors. 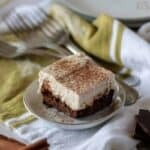 This classic dessert for java lovers is gluten-free and keto friendly. Mix crust ingredients in a medium bowl or directly in a pie pan. Press crust mixture evenly into pie pan. In large bowl, beat cream cheese and sugar until well blended. Add eggs and coffee extract and mix until blended in. Pour filling mixture on top of prepared unbaked crust. Bake at 350°F for 35 to 40 minutes or until center is just slightly jiggly. Just before serving, melt ganache ingredients together in microwave and drizzle on top. About 2 tablespoons of instant coffee can be used instead of the coffee extract. The crust can be left off if desired to save carbs. Just bake the filling directly in the pan. To ensure the cheesecake isn't overcooked, remove it before it sets completely. The center of the pie should still be a little wiggly. Instead of ganache, a light dusting of cocoa powder can be used to top off the cheesecake. 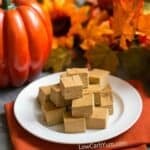 Shavings of low carb chocolate bars can also be used for garnish.